Editor's note: This story has been updated with the Dallas Cowboys' demonstration during their Monday-night game. Several Texas officials are criticizing the National Football League in response to recent demonstrations by players and team staff during the national anthem. Before their games on Sunday, 130 players from teams across the league, including the Houston Texans, knelt, raised fists, locked arms or stayed in locker rooms during the song in protest of racial violence in the United States. Many Texas Republicans have criticized the protests as being disrespectful and divisive, and some have even called for a boycott of the league in response. “No matter a person's grievance, Americans have always honored our flag, our military, our first responders and our country by standing for the national anthem,” Lt. Gov. Dan Patrick said in a statement Monday. NFL players have the right to free speech, but their actions during the anthem are disrespectful U.S. Sens. John Cornyn and Ted Cruz of Texas said in a Sunday interview at the Texas Tribune Festival. Cornyn said the protests communicate a message of “profound ungratefulness and disrespect” toward the military and first responders. U.S. Rep. Pete Sessions, R-Dallas, tweeted that he found it "sad to see people put politics above respecting those who fought for our flag." “Unlimited speech not guaranteed at work,” Simmons tweeted. State Rep. Matt Shaheen, R-Plano, tweeted that NFL ratings dropped on the day of the protests and that he hopes the "NFL learns the anti-American left doesn't solve problems, they create them." State Rep. Matt Krause, R-Fort Worth, published Monday a statement on Facebook expressing disapproval of kneeling during the national anthem but defending the players' right to do so. He also said the players' actions were not "a statement against the country," nor did they respond to police brutality. Krause wrote he felt the protests were in response to President Donald Trump, who has openly criticized on Twitter athletes not standing for the national anthem. Some Democratic legislators have defended the players. U.S. Rep. Sheila Jackson-Lee, D-Houston, knelt in the U.S. House of Representatives chamber in solidarity with the NFL players who protested. Jackson-Lee spoke during a Congressional Black Caucus special order Monday, condemning those who disparaged the protests and arguing that the NFL players were a protected under the First Amendment. "I kneel in front of the flag and on this floor. I kneel in honor of the First Amendment. I kneel because the flag is a symbol for freedom. I kneel because I'm going to stand against racism. I kneel because I'm going to stand with those young men." she said. State Rep. Gene Wu, D-Houston, posted on Twitter defending the right to protest and urging others to consider the players’ message rather than immediately condemning their actions. 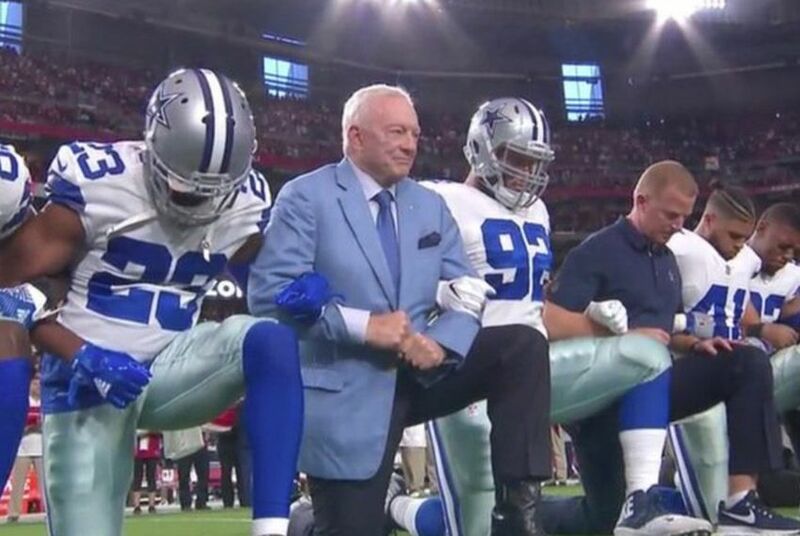 On Monday night before they played their game against the Arizona Cardinals, the entire Dallas Cowboys team linked arms and kneeled with the team's owner, Jerry Jones — though importantly, the demonstration happened before the national anthem for their game against the Arizona Cardinals, not during. The Cowboys tweeted a photo of the team kneeling with the hashtag #FootballIsFamily. Jones had previously expressed disapproval toward the protests during an interview earlier this month. “I do not think the place to express yourself in society is as we recognize the American flag and all the people that have made this great country – the very opportunity for us to be there in front of the nation,” Jones said at the time.